The following post was written by my mother, Jane Davis. With my father, she is growing the decorations for the wedding. When Julia asked me if I would like to grow flowers for her wedding I was delighted. To share in the preparations for my daughter’s celebration of love and commitment to Andy is a joy. So I thought about the date of September 25, which is during the harvest season and right around the date of our usual first frost. Harvest time is a time of plenty, when all our hard work in the garden and the benevolence of mother nature bring us a bounty of fruits, vegetables and flowers. We have been eating well from the garden all summer, but now is the time to put away foods that will sustain us over the winter. Many of our flowers are past their bloom time, and others will fade with the frost. But our memories of them remain. We will not be content with memories for wedding decorations, however, so I have decided to grow decorative gourds and flowers called everlastings. The gourds come in a variety of fanciful shapes, with stripes, spots and bumps of gold and green. If handled gently and cured properly they will last for a very long time. The flower varieties include globe amaranth, statice and strawflowers. Let’s consider the description of globe amaranth from the Fedco catalog – “Easily grown in any soil, likes sun, blooms prolifically. Tolerates dry weather and some frost”. Such is my wish for Julia and Andy’s life together. May they handle one another gently, as if harvesting gourds, and see their love last for a very long time. May their marriage grow easily in any soil, tolerate dry weather and some frost, bloom prolifically, and be everlasting. It’s been a beautiful, sunny, summery weekend. 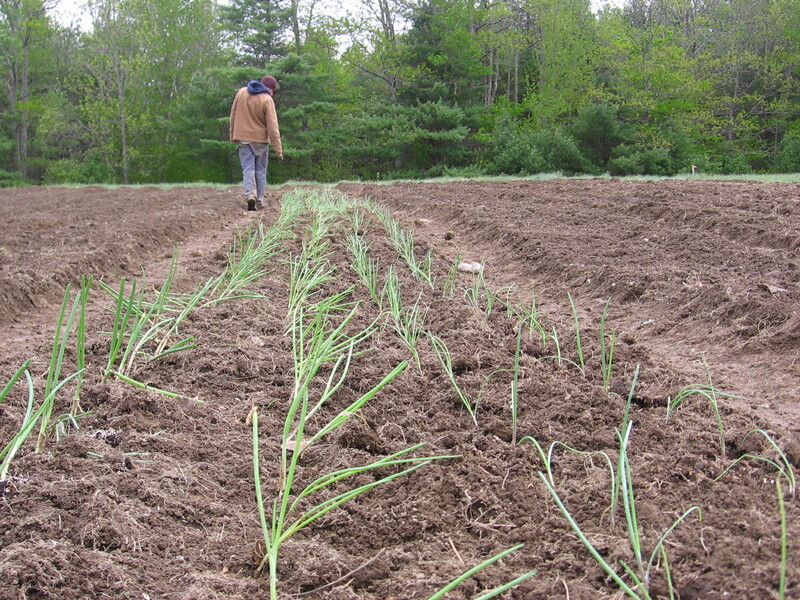 Spring has been mild this year, and we’re tempted to plant many crops now. We have to remind ourselves that the schedule we made is meant to provide food for our September 25 wedding. We’re not looking for early crops. We’re also waiting for the electric fence to go up around our garden, which will probably happen in the first week or two of June. Lastly, we’re very aware of how dry the garden is right now, and we don’t have running water there yet. We would have to haul water from our house, which is around a half mile away. This is not an easy thing to do, especially since we don’t have a truck, yet. So we’re trying to put off planting some crops, and we’re hoping for rain on the seeds we’ve put in the ground. 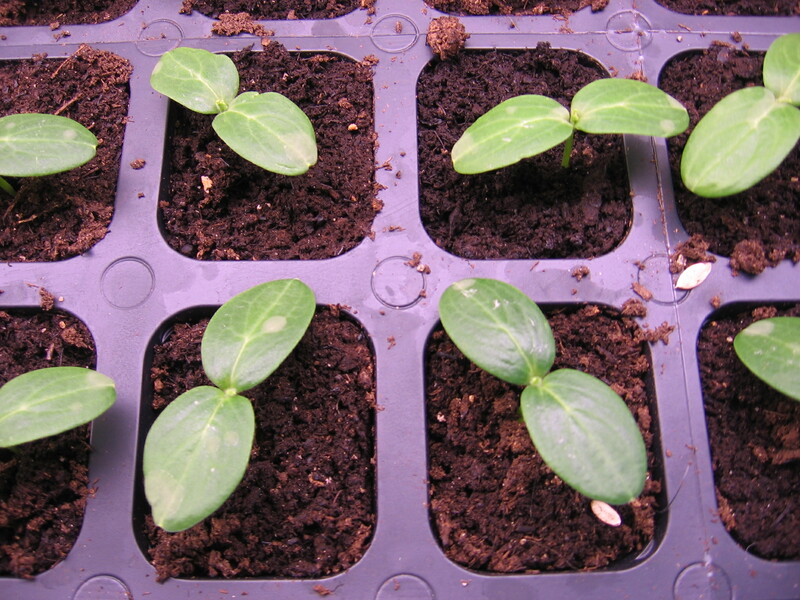 Yesterday we planted Baby Pam pumpkins (good for pie) and two kinds of squash: Waltham Butternut and Hubbard Blue Ballet. We also planted some dill (for making pickles) and some lettuce for us to eat this summer. We also laid black plastic on two beds. This plastic mulch warms the soil and keeps the weeds down. We will transplant heat-loving plants into holes in the black plastic, such as melons, cucumbers, tomatoes and peppers. We were happy to see that our dwarf white clover has germinated in the paths. We planted this short variety of clover in the paths to keep the weeds down and add nitrogen to the soil. Back in our homemade cold frame, many plants are growing well. Our scavenged tomato seedlings are doing well in their bigger pots, cucumbers are huge and peppers are finally sprouting their true leaves. Unfortunately, some tomato seedlings are still quite stunted, but we have enough others that we might not have to use them. Our kale and broccoli seedlings are getting too big for their trays, but we don’t want to transplant them before the fence goes up. Being near the woods, our garden would provide an easy meal for deer. April 27 may have been too early to start these seeds. Our seedling room is a warm, humid sanctuary filled with tomatoes, peppers, basil, dill and melons (which are starting to germinate). I love to sit among the plants and read or do yoga. Farming is an experiment. Especially in the beginning, though I expect we will continue to experiment for the rest of our lives. I wonder if experiment is the right word, though, since we often don’t understand what we’re testing for or why something works or doesn’t work. 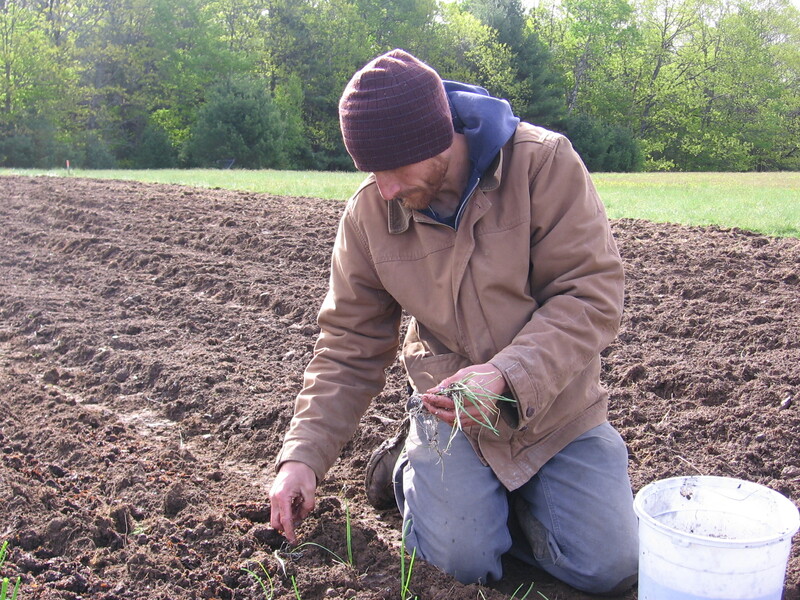 Farming involves guessing, intuition and flexibility. I have to remind myself that failure is a learning experience, which can be a hard thing to do. It’s hard not to feel disappointed when our seedlings are stunted. What if this whole experiment is a failure? It’s a test of our relationship, too, seeing how we deal with things not going right. I might be exaggerating a bit, since I’m just talking about tomato and pepper seedlings, but there is some stress when neither of us know what is the best action to take. I know everything will work out fine in the end. We can buy seedlings if we need to. We could even buy our wedding dinner ingredients (we’ll have to buy at least some). But it would be nice to have a beautiful, healthy garden. 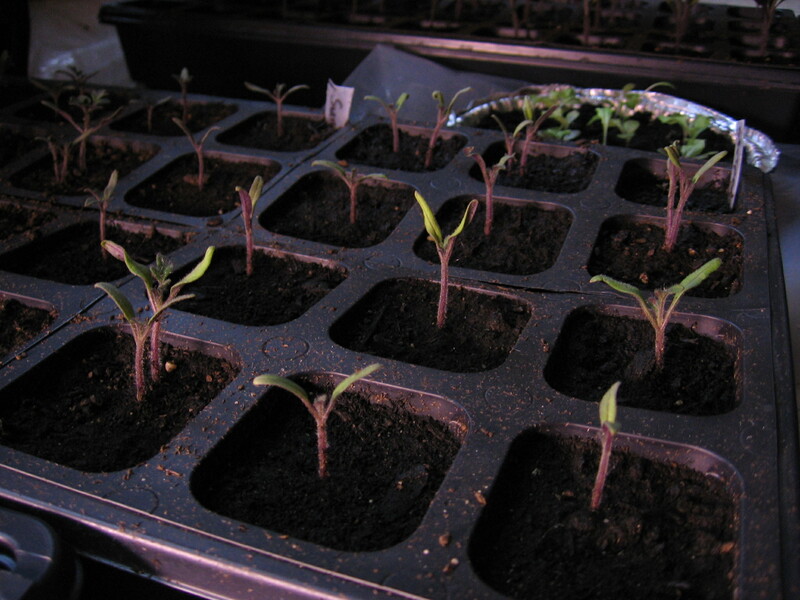 Here’s what’s happening with the seedlings… We planted three kinds of tomatoes and two kinds of peppers on April 15. We put them on a table in Beth’s greenhouse. They germinated fairly well, got to be about an inch high and stopped growing all together. Many of them still haven’t grown their first true leaves (meaning they only have two tiny leaves). It’s a mystery. Beth gave us some reject tomato seedlings that were also very sad looking at the beginning of this month. We re-potted those and they have far surpassed our own tomatoes. We kept those under grow lights in our spare room. This would lead me to believe that our seedlings don’t like Beth’s greenhouse. But she has tomatoes in her greenhouse that are doing great. Hmmmm… curious. Let me know if you have any ideas. 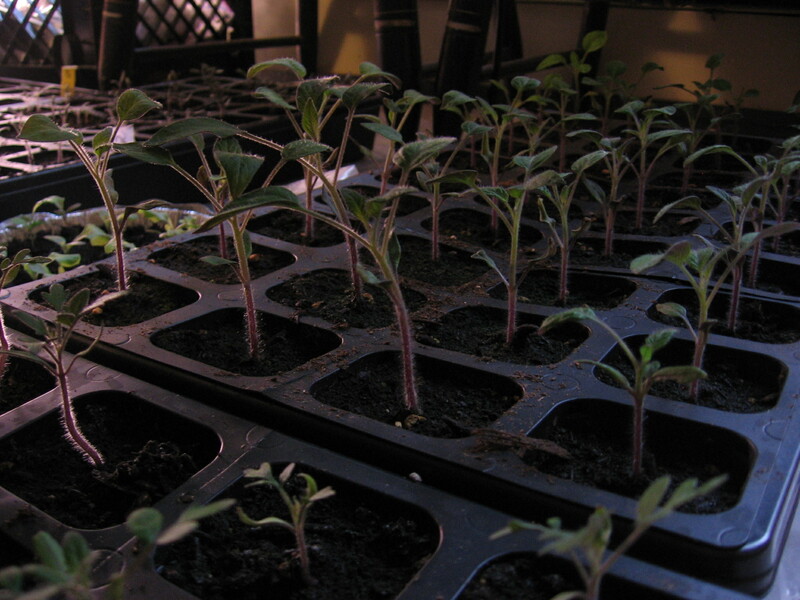 We started potting up some of our pepper seedlings, thinking that might help them, but then we ran out of space under our lights. So we decided to build one of our chicken tractors early and use it as a cold frame for our seedlings. We used scrap wood we got through Midcoast Freecycle, but we did buy screws, corner brackets and a roll of metal strap hanger (which we joked is the novice carpenter’s best friend). With the brackets and strap hanger, our joints hold firmly together even if our cuts aren’t perfect and the wood splits a little as we put in screws. Since we didn’t have very much wood, we decided to make a 59-square-foot A-frame. We’ll probably put 20-25 chickens inside, depending on whether we choose to give them two or three square feet per bird. We’ll have to build another structure for the rest of the meat birds (we ordered 50 chicks). 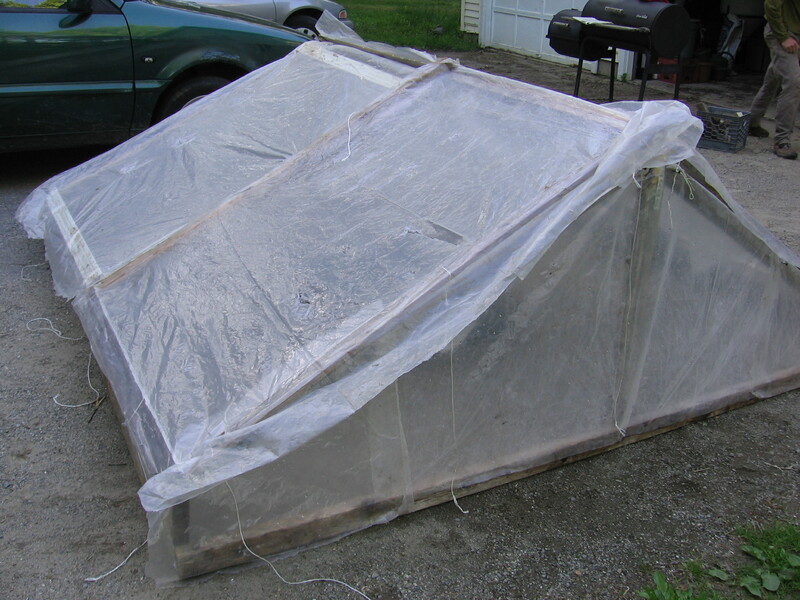 We made panels and covered them with plastic to make a cold frame, or small unheated greenhouse. It’s not perfect, and the plastic doesn’t do much to keep the inside warmer than the outside. We’re still experimenting with it. We might put blankets over the whole structure overnight. We also plan to move it somewhere sunnier than our driveway. But in the meantime, we have our brassicas and some herbs inside the structure and out of the wind at least. 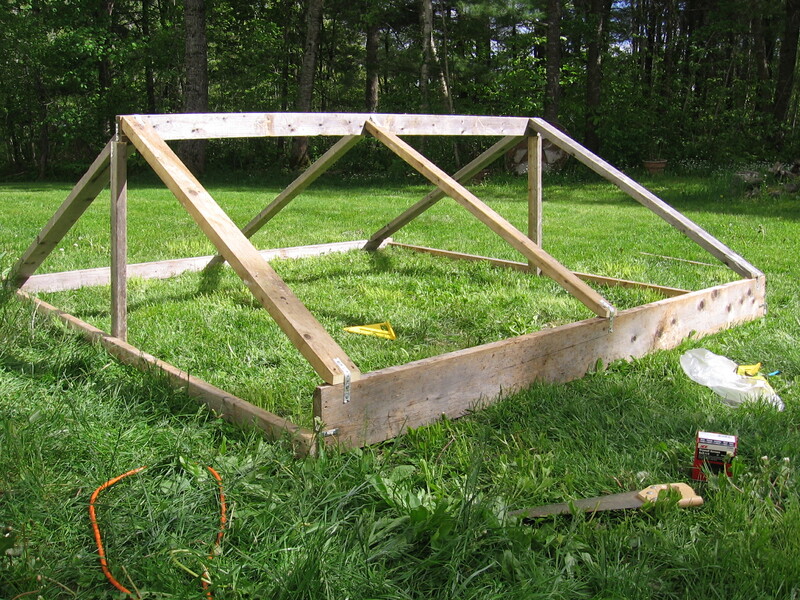 Check out the Photos page for more pictures of us building the chicken tractor/cold frame. Still under lights in the spare room we have beautiful cucumber seedlings, loads of tomatoes, some lettuce and newly planted watermelons and cantaloupes! We love melons! In the garden we’ve planted onions, potatoes, carrots and beets. 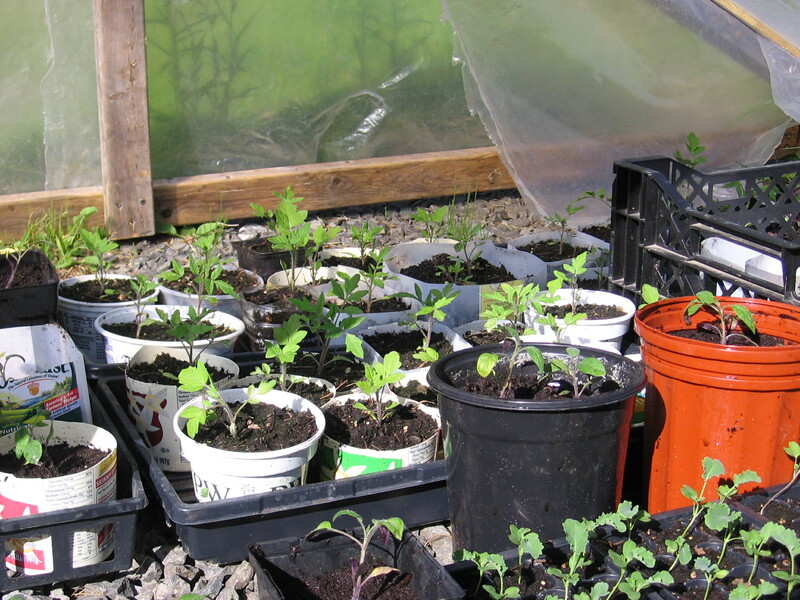 Soon the danger of frost will pass and we’ll plant many more crops in the garden. 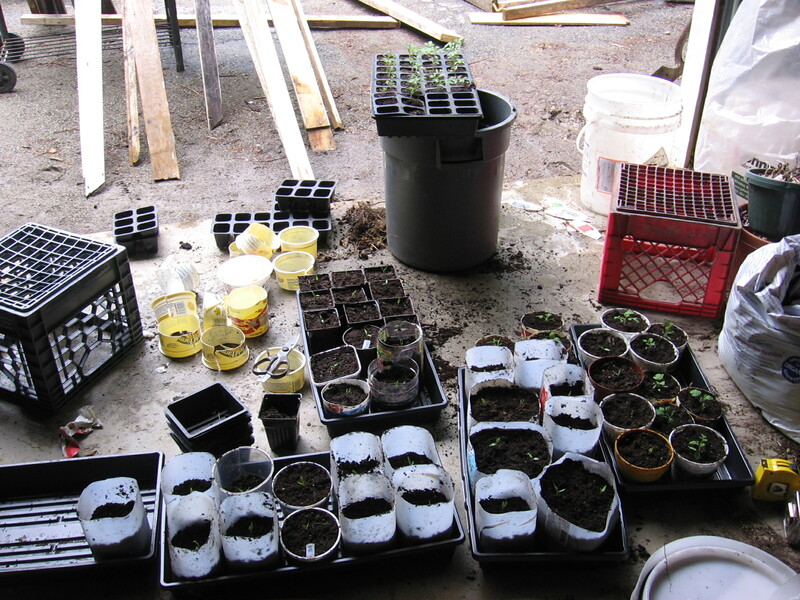 In the meantime, we’re still trying to figure out where to put all our seedlings as we pot them up into any sort of plastic container we can find. The tomatoes really seem to take off when they have more space for their roots. The following post was written by my father, Stan Davis. He and my mother, Jane, are growing the decorations for the wedding. It was my parents who first introduced me to the joys of being outdoors and watching things grow. I will be forever grateful. Today I planted Sunflowers for the wedding. Sunflowers need three things: a place where the deer (who love the leaves) can’t get at the growing plants; a place where they won’t shade the rest of the vegetables; and fertile soil. Given those things, they are the reliable giants of the garden. The traditional oilseed sunflowers grow huge flowers on thick stalks eight feet high. The stems are so massive that people on the dry western prairies are said to have cut and dried them to burn for winter heat. Julia is a hybrid in that sense – she carries in her DNA her mother’s Welsh-English and Pennsylvania Dutch Congregational honesty, ingenuity, willingness to try new things, determination, and creativity and her father’s Eastern European Jewish adventurousness, enthusiasm, and imagination. Andy and I went to a workshop about soil recently, which was presented by a state soil scientist who said that even at a young age, his son knew not to use the word dirt, but to say soil instead. When I was a child I learned to identify different breeds of chickens, and I probably learned other unusual tidbits. Our children, too, will likely have a different set of experiences than most. 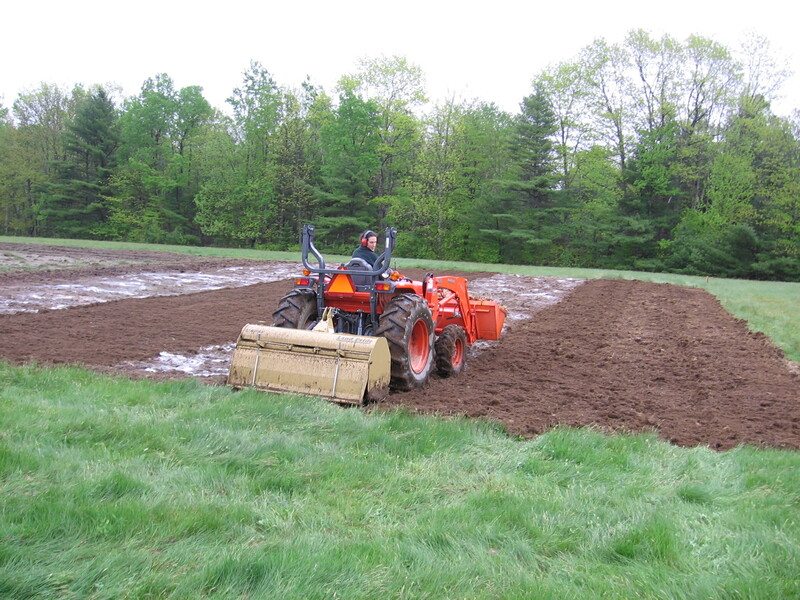 The most interesting part of the soil workshop was the soil scientist’s demonstration of how people dramatically alter the soil structure by plowing and tilling. Naturally, soil is structured in easily identifiable layers. Land that has been plowed, however, even 100 years ago, doesn’t show the same layers. He showed us how you can dig a soil pit and look for the layers to find out if a certain area of land has ever been used for growing crops. The history of human use lies just beneath the surface. We’ve been thinking a lot about soil types ever since we started looking for land to start our own farm. For every property we’re interested in, we look up the soil types on the Web Soil Survey. This website tells us what soil types are found in any particular area, and whether these soils are prime farmland, farmland of statewide importance or not prime farmland. It’s amazing to think that soil maps are around because people literally walked transects of the entire state, testing soil every so often along the way. Soil types can vary quite a bit from one point to the next, even in a fairly small area. So when we started thinking about our wedding garden, we looked up the soil map right away. 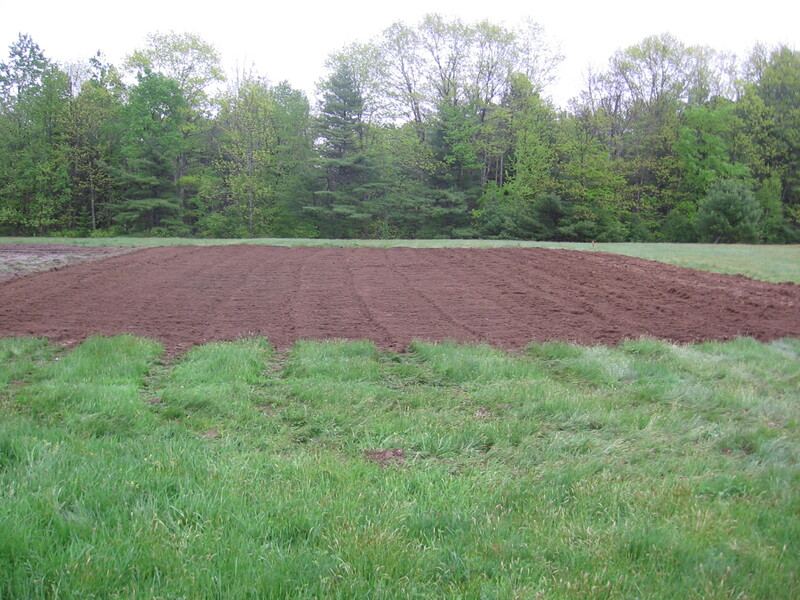 Our garden is Peru fine sandy loam, which is classified as prime farmland. We went a step further and sent a sample of our soil to the Maine Soil Testing Service, which is part of the University of Maine. It came back recently, with pretty good scores in several categories. What we did was take a small sample of soil from around 15 different spots around our garden. Then we mixed the samples together and sent some off in a box to Orono. Several weeks later they sent us a report showing if our soil had low, medium or optimum amounts of different nutrients important for growing vegetables. We found out we have optimum organic matter and sulfur, medium potassium and phosphorus, and low calcium and magnesium. Our soil pH is 5.6, which is optimum for potatoes, but too acidic for other vegetables. The test report also showed results for micronutrients. More on that later. It’s hard to know what to do with these results. Okay, so we don’t have enough calcium and magnesium. Will that really hinder our plants? How do we fix that? I did some more reading. Lime, which is a common soil amendment to raise the pH (make the soil more basic), is also a primary source of calcium. Magnesium, too, can be provided by using dolomitic lime. That made things easier. All we had to do was spread lime to fix the soil pH and low levels of magnesium and calcium. We also decided to spread wood ash from our wood stove. Wood ash provides potassium and raises the pH, so we decreased the amount of lime accordingly. Like I mentioned before, our soil tests also listed micronutrient content for copper, iron, manganese and zinc. These elements are important for plants’ growth and productivity, but they are only needed in small amounts. I learned that the availability of the micronutrients is driven by pH and organic matter. When these two factors are at good levels, often micronutrients will follow. On Saturday we spread our amendments and tilled them in, with some goat manure as well. It’s just empty soil, but it sure does look beautiful! Perhaps my strong distaste for waste comes from going to the dump with my dad, or maybe it’s somehow built into my genes. My father often talks about how resourceful his mother was. Either way, I hate to see things wasted, and so does Andy. I call every company that sends me a catalog to get off their mailing list. I always flip to the free section of Uncle Henry’s first. Andy and I go dumpster diving for juice and bread, and we’re always trying to figure out how to use what we have instead of buying something new. Once we have a permanent home, I just know we’re going to accumulate stuff like crazy – scrap wood, fencing, tools, all kinds of things. I find it remarkable that Andy and I share this distaste for waste. Sometimes what we do to avoid throwing things away is a bit excessive, but I do think this will serve us well as farmers. If we can make do with buying less inputs, that means more profits or cheaper prices. The same rings true for this summer’s wedding garden. I’ve said before that we don’t have much money, so we’re always looking around for free or cheap resources. One example is fertilizer. Though we haven’t gotten the results back from our soil test, we’re assuming our garden will need some nutrients. 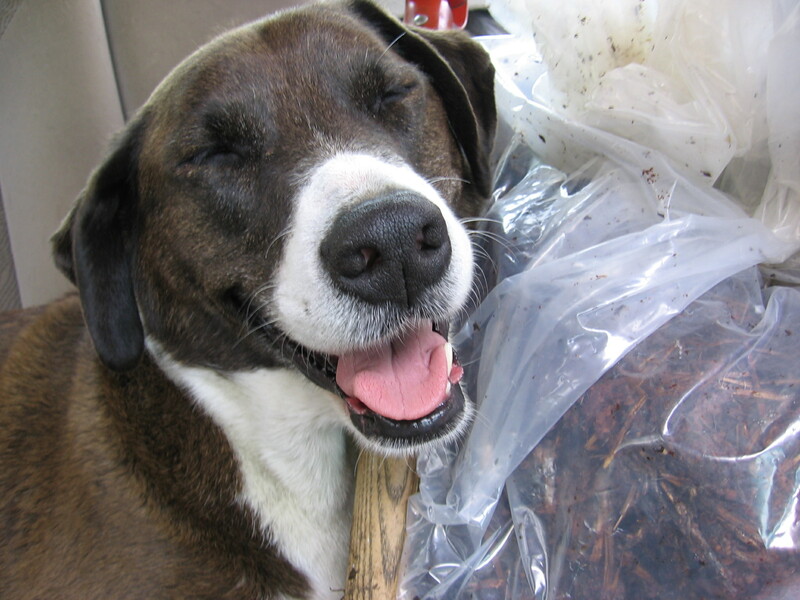 We thought about buying compost, but that would be expensive. Instead, we asked a local goat farmer if we could use some of the goat manure she has been piling up in a goat yard for years. Yesterday, on a beautiful spring Sunday, we went over to one of the places where the goats spend their time (they weren’t there at the time) and started shoveling. 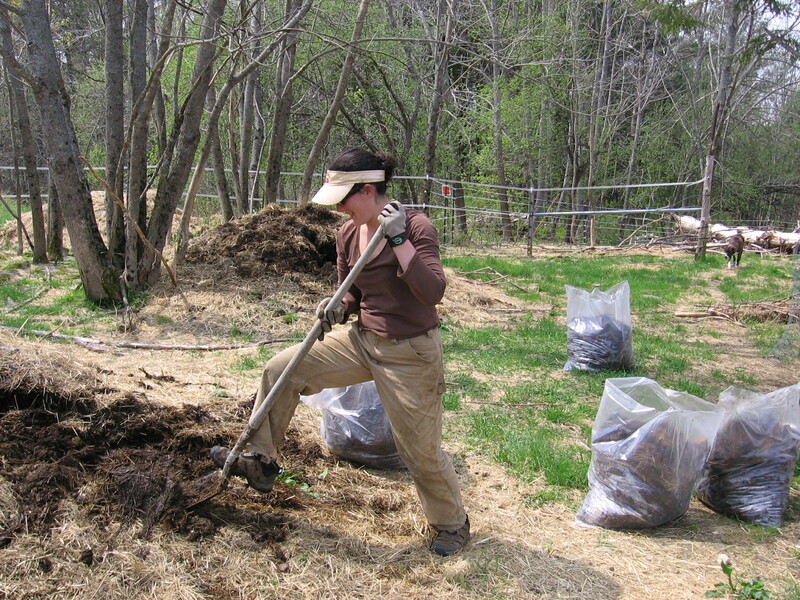 What a beautiful day to shovel manure! I’m also a member of a Yahoo group called Freecycle Midcoast Maine. People post items they want to get rid of or things they want. By responding to a post to that group, we got free scrap wood to build our chicken tractor. 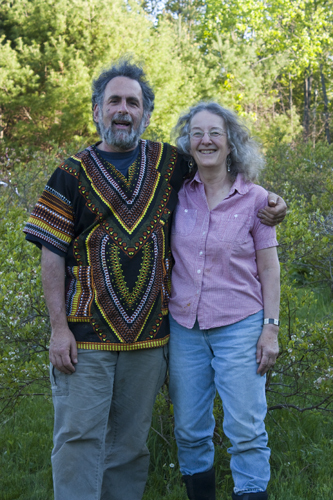 Andy is working for Beth at Dandelion Spring Farm for a few weeks. He was working on potting up tomatoes last week, and some seedlings were too sad looking to be worth the time and effort to pot up. 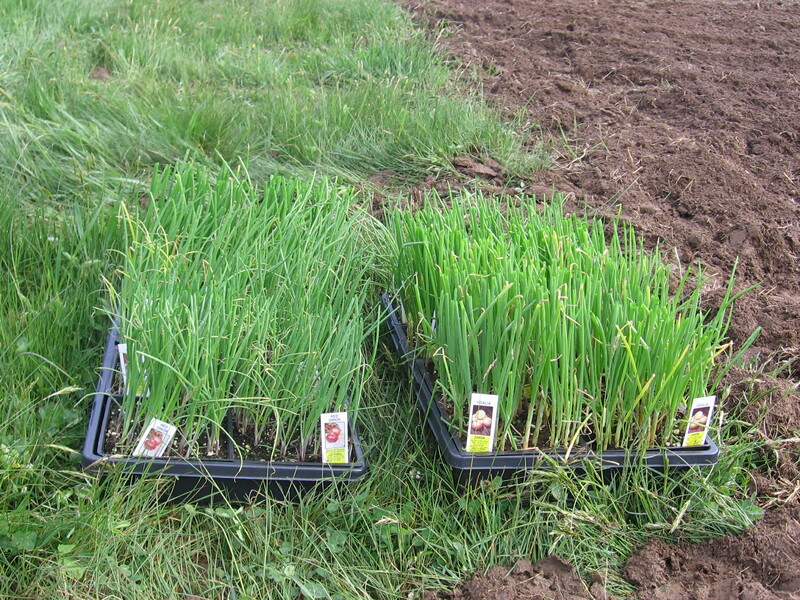 At her scale, Beth plants extras and it doesn’t make sense to save every seedling. But we’ve got the time and space, and we’re more than happy to try nursing these spindly seedlings back to health. 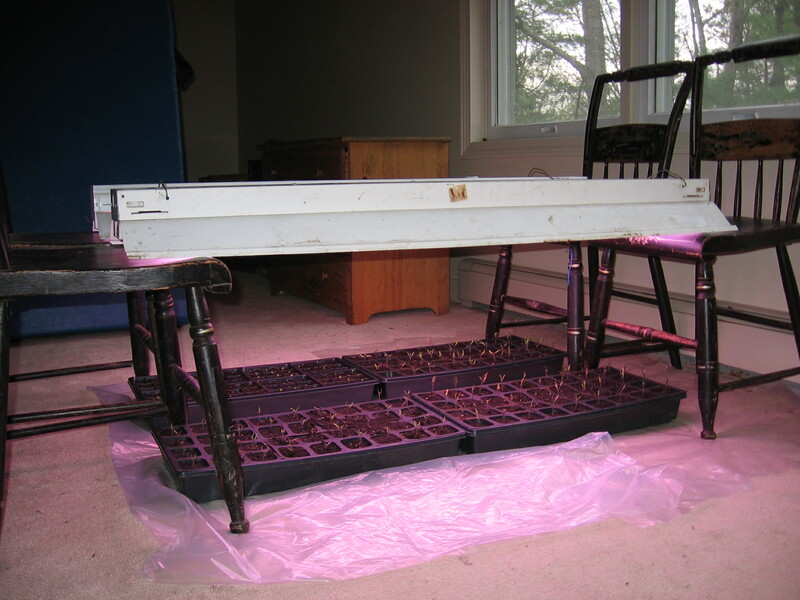 Andy and I re-potted them in new soil and put them in a spare room upstairs under lights. Hopefully they’ll make it. We’ve also been saving and collecting milk jugs and other plastic containers as plant pots, instead of buying stacks of plastic pots. Unfortunately, we did buy plastic seed trays. Though we don’t like using plastic, especially plastic that breaks easily and needs to be thrown away, these trays are the most convenient for us right now. 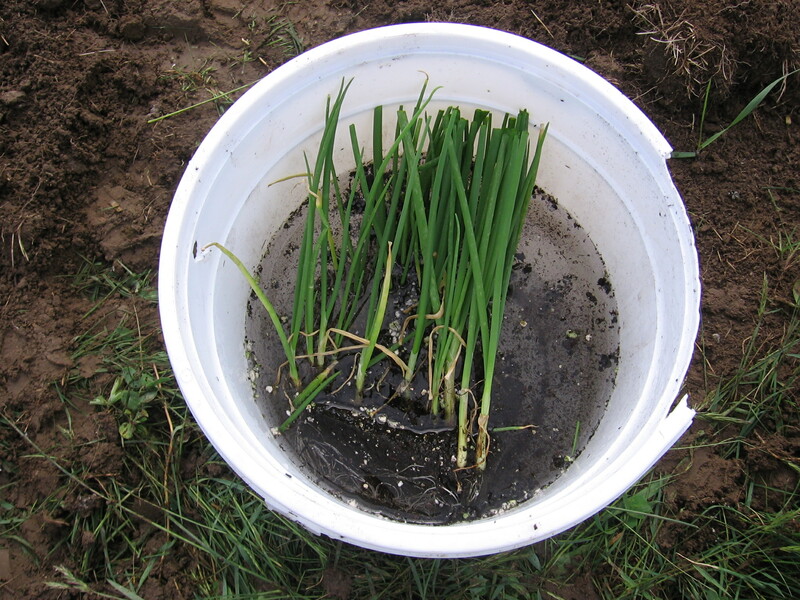 Some day perhaps we’ll use soil block makers, which create blocks of soil to plant in, no plastic necessary. 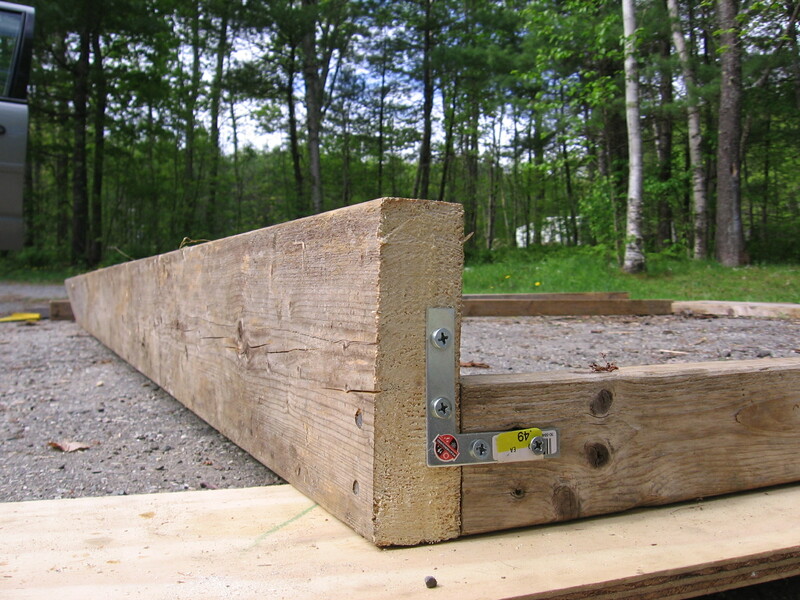 Watch a video about soil block makers here. We’d love to build our house this way – scavenging windows and doors and wood and fixtures that other people are trying to get rid of and putting it all together into a house that’s functional and unique. We’ll see. The first step is to find some land. I’ll write more about the process of looking for farmland later.